The student body has spoken. The Student Body President for the 2019-2020 academic year will be Gianni Vito'20. 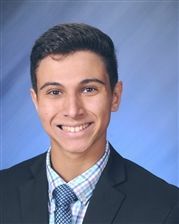 Gianni currently serves as the Junior Class President and Homeroom Representative while also being involved with Peer Ministry, National Honor Society, Theatre, Italian Club, Volleyball and Theatre. During his time at Calvert Hall, he has participated in Speech & Debate, the Tech Proficiency Club, and Spanish National Honor Society, and the Tennis team. He served as the Freshman and Sophomore Class President during those respective years.